One of the highlights of the film, Gone in Sixty Seconds, was watching Eleanor outrun and outhandle the swarm of vehicles chasing Nicolas Cage. You can be sure that the average Mustang doesn't corner as 'flat' and isn't nearly as maneuverable as the movie would make them out to be. Well, other than the climactic jump scene at the end of the movie, "Hollywood Magic" didn't have anything to do with how well Eleanor handled. Without the magic of Hollywood your Mustang, Cougar, Falcon, etc. can handle just as well or better than the famous Eleanor. Depending upon what each particular 'driven' movie car was used for they used our manual or power rack and pinion system. 'Driven' is emphasized because some of the cars were used for long distance or static shots and did not need anything more than a quick paint job and the wheels. For some of the more intricate driving scenes the power rack and pinion and TCP power steering pump made the stunt drivers jobs much easier. The original factory steering boxes just do not have the precision to perform at the level the stunt drivers required. 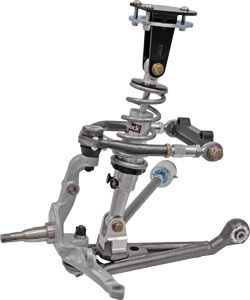 To enhance the cornering characteristics of the stunt cars, our front coilover kits were put to use. Each system used our coilover shocks with 'track-only' springs since ride quality wasn't really a concern. A couple of the kits, used for filming the jump scene, actually used 700 lb springs. Portions of this scene were shot using a small take-off ramp to film the car's landing. For a street driven car we definately wouldn't recommend going over a 500 lb spring. For the really demanding chase scenes a 1 1/8" stabilizer bar was used to reduce body roll. 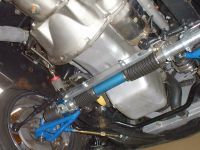 Subframe connectors and tower brace kits were also installed to increase the overall responsiveness of the chassis. Not that anyone would do this but... Installing these components on your vehicle does not mean that you can launch your car off the back of a flatbed tow truck, fly 200 feet through the air and land somewhat safely and still drive away or even live through it for that matter. What these components will do is help you to avoid the flatbed tow truck that you didn't see till the last second by making your car handle more like a sportscar.